Background: Presently it is difficult to differentiate malignancy for thyroid nodules by palpation, ultrasonography and fine-needle aspiration cytology (FNAC) at the outpatient department, especially for solitary thyroid nodule (STN). So a great emphasis should be placed on the STN. AIms: The objective of this study was to investigate the predictive clinicopathological risk factors for malignancy in patients with STN and further to provide an appropriate clinical management. Materials and Methods: The records were reviewed from 265 patients with STN who had undergone thyroidectomy in our hospital. All cases were classified as two independent groups in terms of the final pathological results to assess the independent risk factors using a multinomial logistic regression analysis. Results: A multinomial logistic analysis revealed that the male gender, microcalcification and cervical lymphadenopathy were independent risk factors related to malignancy in patients with STN. The incidence of malignancy in patients with 0,1,2,3 risks was 10.71%, 26.6%, 61.43%, and 100%, respectively. Conclusions: Male gender, microcalcification and lymphadenopathy were independent risk factors for predicting the malignancy in patients with STN. Patients with more than two of those risk factors should be subjected to further examination or thyroidectomy. The findings may provide a simple and reasonable management for the STN. Thyroid nodules are very common clinical findings, with an estimated prevalence on the basis of palpation, of 3-7%, and on the basis of ultrasound examination of 20-76%, respectively. ,,, Although the reported general incidence of thyroid carcinoma is only approximately 5% in the population, ,,, some studies implied that the incidence of malignancy may be higher for solitary nodules than for multiple nodules. ,, We clearly know it is impossible to perform the task of examining every patient who has STN and use all tests to evaluate the nature of the nodules. So the accurate prediction of malignancy is of great importance to select appropriate treatment strategies that can avoid unnecessary extensive procedures and diagnostic thyroidectomy which may bring potential adverse effects, such as hypothyroidism, body suffering and so on. So we evaluated the clinicopathological risk factors for malignancy and depend on the results to offer a reasonable method to treat STN. Our study consisted of 265 patients with STN who had undergone partial or total thyroidectomy between October 2007 and October 2010 in the area II, Department of General Surgery in our institution. Among these patients 140 (52.83%), 104 (39.25) and 21 (7.92%) patients had undergone bobectomy plus isthmectomy or less-than-total thyroidectomy and near-total and total thyroidectomy respectively. The objective of the surgery was to exclude or remove malignant nodules. Most patients presented with an asymptomatic mass discovered by a doctor on routine neck palpation or by the patients during self-examination. 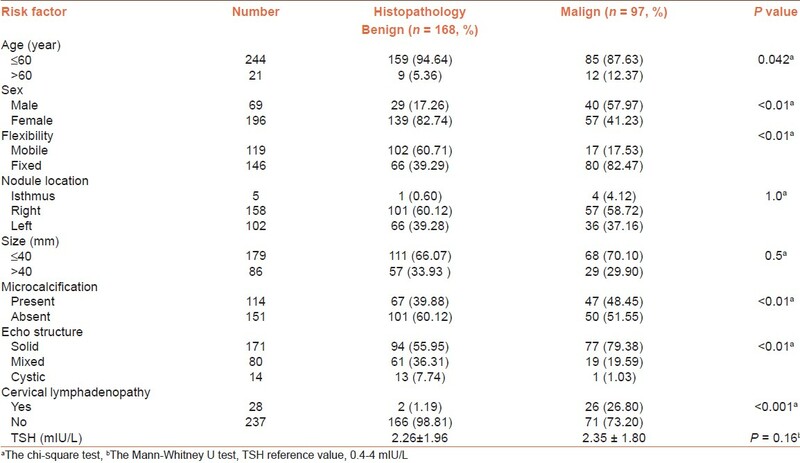 The final histopathologic results are showed in [Table 1]. None of the patients had previous exposure to ionizing irradiation or family history of thyroid cancer. [Table 2] shows the clinicopathological characteristics of STN assessed mainly according to the paper NCCN Thyroid carcinoma Clinical Practice Guidelines in oncology V.I.2009. The group comprised 69 men and 196 women, aged 43.22 ± 11.86 years (mean ± standard deviation). All nodules were palpable, more than 1 cm in diameter and all patients were diagnosed as STN by routine color Doppler ultrasound without serve symptoms. Nodule size (as <40 mm, ≥40 mm in the largest diameter), structure as cystic, solid or mixed, presence of microcalcification inside the nodule, nodular location and cervical lymphadenopathy were also assessed on the basis of ultrasound findings. Thyroid stimulating hormone (TSH) was routinely assessed in our general surgery department in our clinic lab before surgery and the reference value of TSH is showed in [Table 2]. All patients enrolled were subjected to intraoperative frozen section (IFS) and had not received radiotherapy before surgery. FNAC and radiological 99m TcO4 test were carried out in 51 out of the 265 patients. Statistical comparisons were performed using the Mann-Whitney U text for continuous data and using the chi-square test for categorical data between two independent groups. Assessment of independent factors from the clinicopathological features was performed using a multinomial logistic regression analysis. Statistical analyses were performed using SPSS 17.0 for Windows. The level of significance was accepted at P < 0.05. Twenty-six patients underwent total thyroidectomy combining central compartmental clearance, because cervical lymphadenopathy was confirmed by color Doppler ultrasound or intraoperative exploration. Seventy-one patients with malignant nodules without the evidence of lymphadenopathy underwent near-total thyroidectomy. One hundred and one patients underwent less-than-total thyroidectomy at the same side (nodule size ≤4 cm), and 57 patients underwent near-total thyroidectomy at the same side (nodule size >4 cm). According to the final histological results, 97 (33.6%) cases were malignant and 168 patients were diagnosed with benign lesions. Eighty-three (85.57%) cases were papillary cancer which is dominant in malignant thyroid nodules. Simple adenoma, in 84 patients, was the commonest histopathologic result in the benign lesions. Besides, there were some special pathologic types that were distinguished by immunohistochemical technique. They comprised epidermoid cancer (2 cases), mucoepidermoid cancer (1 case), neuroendocrine cancer (1 case) and diffuse large B-cell lymphoma seldom (2 cases) which were initially reported as a solitary nodule in the thyroid gland. 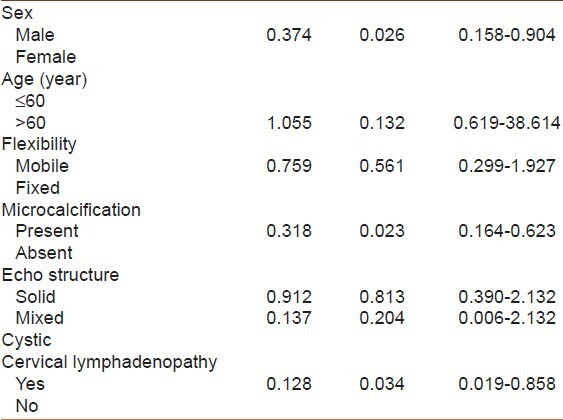 [Table 2] indicates the relationship between clinicopathological factors and thyroid cancer in 265 patients with STN. Univariate analysis revealed that age ≥60 years, male gender, microcalcification, solid echo structure and cervical lymphadenopathy were greatly associated with thyroid cancer (P = 0.042, P = 0.01, P = 0.01, P = 0.01, P = 0.01 respectively), and there was no significant association with nodule location, tumor size and the level of TSH between the two groups. [Table 3] indicates that the results of multinomial logistic regression analysis for risk factors correlated with thyroid cancer in 265 patients with STN. It revealed that male gender, microcalcification and cervical lymphadenopathy were independent risk factors for thyroid cancer (P = 0.029, P < 0.001, P = 0.034 respectively). The risk scores were based on the independent risk factors showed in [Table 4]. Each patient who had one independent risk factor got a score of 1 for the following risk factors: male gender, microcalcification and cervical lymphadenopathy. Therefore the risk scores were the summation of the scores in each patient. [Table 4] shows that the incidence of thyroid cancer in 265 patients with 0, 1, 2 and 3 risk scores was 13.33%, 26.06%, 60.94% and 100%, respectively. Patients with 2 or 3 risk scores were significantly correlated with a higher incidence of malignancy. Solitary thyroid nodule is defined clinically as a localized thyroid enlargement with an apparently normal remaining gland. In our study, 36.6% (97) of the 265 patients were proved to be malignant, which was higher than the general incidence of malignancy 5% and similar to the reported 30-42.27% incidence in the papers. ,, It seems that STN has a higher risk of malignancy than multi-nodules, so in this condition we should focus on the potential danger to all these patients. We also revealed that male gender, age ≥60 years old, microcalcification, solid echo structure, fixed and cervical lymphadenopathy were significantly associated with malignancy in univariate analysis among these patients. As previously reported, thyroid nodules are four times more in women than in men,  but the incidence of malignancy in male patients is approximately twice that found in females, a proportion that is similar to the previously reported study. One paper revealed that age more than 60 years was associated with malignancy in STN by Simon et al.,  which is seemingly in accordance with our study. They also revealed nodule size larger than 4 cm is more closely related to thyroid malignancy, but we could not support the view in our study. We revealed that there was no great significance between nodule size larger than 4 cm and nodule size less than 4 cm (P = 0.5). Nodule size is not a predictive risk factor for malignancy, but enlarging nodule over a short period may be an increased risk for malignancy in thyroid nodule as reported by Hossein Gharib et al. Furthermore, the prevalence of cancer ranges from 5.4-7.7% in studies regarding the cytologic evaluation of non-palpable thyroid lesions seems to be similar to that reported malignancy lesions (5.0-6.5%). , So the nodule size is still co ntroversial as be a predictive risk factor for malignancy. We have previously shown that male gender, microcalcification, and cervical lymphadenopathy were independent risk factors for thyroid cancer in a multinomial logistic analysis. Therefore these factors were the most important factors predicting malignancy in patients with STN. Although surgery is the one of most effective methods to treat STN including lobectomy plus isthmectomy, less-than-total thyroidectomy, and near-total or total thyroidectomy, benign nodules without servere symptoms do not require surgery. What is more, aggressive surgery may be regarded as an excessive medical treatment. So determining the nature of solitary nodules is of utmost importance. In this study, the predictive value of the combination of three independent risk factors for malignancy (male gender, microcalcification and cervical lymphadenopathy) as determined using a multinomial logistic regression analysis, was examined to predict malignancy as accurately as possible. So we established a simple criterion for the management for STN in order to easily evaluate the nature of the nodules. In the our study, the incidence of malignancy was 13.33%, 26.06%, 60.94% and 100%, respectively, among patients with 0, 1, 2 and 3 risk scores, suggesting that further examination or surgery might be performed for patients with 2 or 3 independent risk factors. Presence of 2 or 3 risk factors was significantly correlated with a higher incidence of malignancy (P < 0.01). In addition, FNAC is recommended to be a cost-effective procedure in the initial assessment and management of thyroid nodules. But FNAC is not recommended as a routine examination in our hospital. Only 51 patients had undergone FNAC. Although there are no a large number of relevant cases, it is sufficient to figure out the following index for FANC, FS and the final histology results respectively : sensitivity (SEN), specificity (SPE), positive predictive value (PPV), negative predictive value (NPV), and accuracy (ACC) using the formulates given in the article. [Table 5] shows the FNAC findings in 51 patients, 41% cases were found to be benign, 41% cases were suspicious and 18% cases were malignant. The incidence in the final pathological results was found to be 28%, 76%, 100% for benign, suspicious, and malignant respectively. The SEN, SPE, PPV, NPV and ACC for FNAC was 80%, 75%, 83%, 71% and 76% respectively. The comparison of the predictive indices between FNAC and FS showed that there is no significant difference between the two groups (P = 0.383). Because of high accuracy, FNAC was the one of most effective methods to distinguish between benign and malignant thyroid nodule as previously reported. ,,, Our study concluded that FNAC should be recommended for with patients with 2 risk factors. Besides, FS was deemed to be the golden standard to distinguish the nature of STN intraoperatively. But the difference of effectiveness between FNAC and FS in STN is still more controversial. Lots of studies reported FNAC and FS to be equally effective in diagnosing papillary cancer. The main drawback of FNAC lies in its difficulty in differentiating between follicular adenoma and follicular carcinoma. If FNAC findings can determine the malignancy, FS should not be recommended in these patients. Some indeterminate FNAC findings should be need repeat or perform FS. Besides FS is specific and cost-effective in determining the extent of surgery in patients with suspicious or malignant FNAC findings. FS should be performed at the time of surgery to help guide surgical decision-making but may be of limited use in distinguishing benign from malignant follicular lesions. In this case the combination of FNAC and FS may be effective. In conclusion, the challenge of management is to identify benign nodules and to accurately diagnose and treat malignant disease early. At present, there is no unified standard to treat solitary thyroid nodules. The following advice may be referred. (1) If the cytology has already confirmed the nodules to be malignant, surgery can be recommended to carry out surgery. (2) In the clinic, if we are highly suspicious of that the nodule, surgery should be carried out to remove the malignant possibility. (3) Although simple adenomas is the most common pathology type presenting STN, there are the possibility of 10% to be malignancy. Besides, it is difficult to differentiate between papillary cystic adenoma and papillary cancer, so this kind of nodule should be resected early to discern whether it has the canceration or not according to clinical practice guidelines in our country. On the basis of the results of this study and the authoritative papers, ,, we have designed a procedure to evaluate and manage the disease [Figure 1], which may give a practical, cost-effective and systemic method to help the doctor to select the appropriate way to follow. We deeply appreciate the support form the medical records room, the first hospital affiliated An-Hui Medical University. 1. Hegedüs L. Clinical practice: The thyroid nodule. N Engl J Med 2004;351:1764-71. 2. Vander J B, Gaston E A, Dawber TR. The significance of nontoxic thyroid nodules: Final report of a 15-year study of the incidence of thyroid malignancy. Ann Intern Med 1968;69:537-40. 3. Tan GH, Gharib H. Thyroid incidentalomas: Management approaches to nonpalpable nodules discovered incidentally on thyroid imaging. Ann Intern Med 1997;126:226-31. 4. Ezzat S, Sarti DA, Cain DR, Braunstein GD. Thyroid incidentalomas: Prevalence by palpation and ultrasonography. Arch Inter Med 1994;154:1838-40. 5. Mazzaferri EL. Thyroid cancer in thyroid nodules: Finding a needle in the haystack. Am J Med 1992;93:359-62. 6. Gharib H, Goellner JR. Fine-needle aspiration biopsy of the thyroid: An appraisal. Ann Intern Med 1993;118:282-9. 7. Giuffrida D, Gharib H. Controversies in the management of cold, hot, and occult thyroid nodules. Am J Med 1995;99:642-50. 8. Castro M R, Gharib H. Thyroid nodules and cancer. When to wait and watch, when to refer. Postgrad Med 2000;107:113-24. 9. Nakhjavani M, Gharib H. Diffuse nontoxic and multinodular goiter. Curr Ther Endocrinol Metab 1997;6:109-12. 10. Iqbal M, Mehmood Z, Rasul S, Inamullah, H Shah SS, Bokhari I. Carcinoma thyroid in multi and uninodular goiter. J Coll Physicians Surg Pak 2010;20:310-2. 11. Gupta M, Gupta S, Gupta VB. Correlation of fine needle aspiration cytology with histopathology in the diagnosis of solitary thyroid nodule. J Thyroid Res 2010;2010:379051. 12. Mazzaferri EL. Management of a solitary thyroid nodule. N Engl J Med 1993;328:553-9. 13. Kuru B, Gulcelik NE, Gulcelik MA, Dincer H. Predictive index for carcinoma of thyroid nodules and its integration with fine-needle aspiration cytology. Head Neck 2009;31:856-66. 14. Duek SD, Goldenberg D, Linn S, Krausz MM, Hershko DD. The role of fine-needle aspiration and intraoperative frozen section in the surgical management of solitary thyroid nodules. Surg Today 2002;32:857-61. 15. Gharib H, Papini E, Paschke R, Duick DS, Valcavi R, Hegedüs L, et al. ; AACE/AME/ETA Task Force on Thyroid Nodules. American Association of Clinical Endocrinologists, Associazione Medici Endocrinologi, and European Thyroid Association medical guidelines for clinical practice for the diagnosis and management of thyroid nodules. J Endocrinol Invest 2010;33:1-50. 16. Papini E, Guglielmi R, Bianchini A, Crescenzi A, Taccogna S, Nardi F, et al. Risk of malignancy in nonpalpable thyroid nodules:predictive value of ultrasound and color-Doppler features. J Clin Endocrinol Metab 2002;87:1941-6. 17. Hagag P, Strauss S, Weiss M. Role of ultrasound-guided fine-needle aspiration biopsy in evaluation of nonpalpable thyroid nodules. 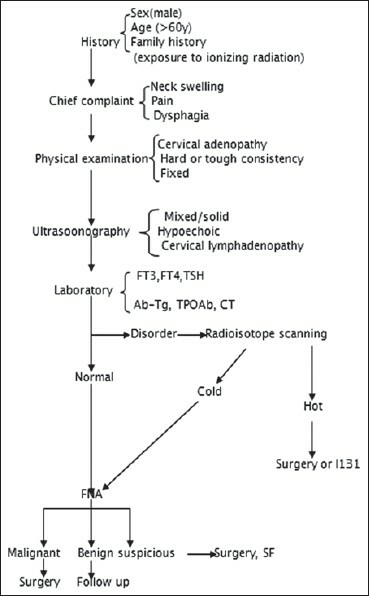 Thyroid 1998;8:989-95. 18. Chao TC, Lin JD, Chao HH, Hsueh C, Chen MF. Surgical Treatment of Solitary Thyroid Nodules Via Fine-Needle Aspiration Biopsy and Frozen-Section Analysis. Ann Surg Oncol 2007;14:712-8. 19. Layfield LJ, Cibas ES, Gharib H, Mandel SJ. Thyroid aspiration cytology: Current status. CA Cancer J Clin 2009;59:99-110. 20. Lngegowda JB, Muddegowda PH, Rajesh KN, Ramkumar KR. Application of pattern analysis in fine needle aspiration of solitary nodule of thyroid. J Cytol 2010;27:1-7. 21. Udelsman R, Westra WH, Donovan PI, Sohn TA, Cameron JL. Randomized prospective evaluation of frozen-section analysis for follicular neoplasms of the thyroid. Ann Surg 2001;233:716-22. 22. Gharib H, Papini E. Thyroid nodules: Clinical importance, assessment, and treatment. Endocrinol Metab Clin N Am 2007;36:707-35. 23. Pacini F, Burroni L, Ciuoli C, Di Cairano G, Guarino E. Management of thyroid nodules: A clinicopathological, evidence-based approach. Eur J Nucl Med Mol Imaging 2004;31:1443-9.